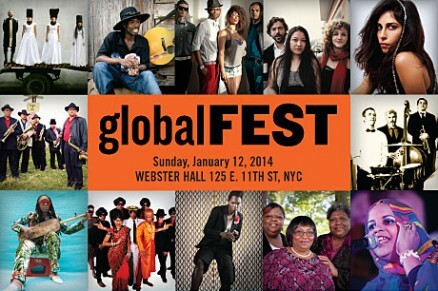 globalFEST, America’s catalytic springboard showcase/festival and year round service organization for world music. Taste-makers for an increasingly diverse and innovative planet-spanning scene, this one-night festival will gather a dozen international acts at New York City’s Webster Hall on January 12, 2014. That single evening will witness everything from vintage Bollywood confections from Down Under to soaring, heartfelt gospel from the deep South, from lush big bands to the sparest single-string guitar. Long-revered artists—including seminal performers who put Gypsy brass and North African Gnawa trance music on the map—will cross paths with rarely heard masters from little-explored genres.